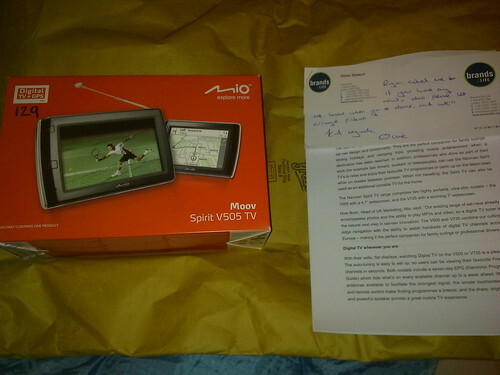 So today I was lucky enough to take delivery of a Mio Moov Spirit V505 from Brands2Life. The in car Sat Nav system which as a little quirk works as a built in TV as well, this isn’t something which I’ll be fiddling too much with today though. Tonight we are driving to London, to a part of London we haven’t driven to before so an accurate Sat Nav will be a lifesaver. First thoughts on the Mio are good, the big buttons make everything easy to do, and I’m sure even easier when driving along! I have already been able to program in the destination for later which saves time, I don’t have a GPS signal in my room to plan the route however, which is no surprise as I struggle for Vodafone signal as well. As a comparison I will also have my N97 out, to test out the new(ish) free Ovi Maps navigation support. It’s about time this service became free, could this be the thing which clinches the mobile Sat Nav marked? And probably more importantly pushes Nokia users to use Ovi services instead of Google ones… Until now I have always been a Google Maps man so we will have to wait and see how it goes. My main concern is battery life, I some what doubt the N97 can handle 2 hours worth of ‘doing’ without a charge.